Mutations are physical changes in genes and chromosomes . They may be confined to a single cell or may be transmitted from one cell to another within a multicellular organism (somatic cell mutation), or may be transmitted from one generation to another through mutation in the gametes (germ-line mutation). Mutations may be caused by natural events within the environment, by action or inaction of deoxyribonucleic acid (DNA) repair enzymes , and by human production of chemicals or high-energy radiation (mutagens). 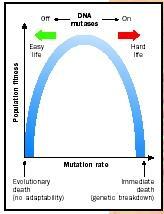 Mutation rates vary from organism to organism, from gene to gene, from time to time, and from place to place. They can have a significant effect not only on the individual, but on the evolution of species. Since genes are composed of DNA, nearly anything that can change the structural composition, sequence, physical integrity, or length of a DNA molecule can cause mutations. Breakages may be caused by physical damage such as being severed by ice crystals in a frozen cell or violent agitation from high temperature. Exposure to high-energy radiation (bombardment by alpha, beta, or gamma particles) or ultraviolet light can have a similar effect. A variety of chemicals act as mutagens. Some chemicals, such as bromouracil, are structurally similar to DNA bases, and are inserted in place of normal bases. Ethidium bromide has a structure that allows it to wedge within the DNA double helix (intercalation), and is used as a stain for DNA. Many other chemicals, such as peroxides and mustard gas, chemically modify DNA. Mutagens, which affect DNA, are distinct from teratogens , which influence the embryological development of an individual without necessarily affecting DNA structure. For example, thalidomide, a tranquilizer, causes nongenetic birth defects such as shortened limbs. Sensitive tests for identifying mutagens, like the Ames test, frequently also identify teratogens. 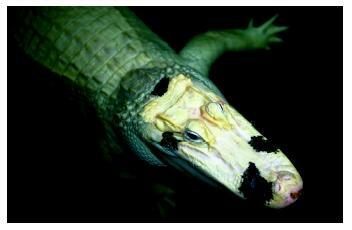 A white American alligator shows a genetic mutation known as leucism. This allele controls migration of pigment cells during development; absence in cells leads to white patches on the skin. greatly influenced by the cutting activities of DNA polymerases, which usually cut out incorrectly added nucleotides . Study of bacteria with high mutation rates (mutator strains) has shown they often have DNA polymerases with limited 3 to 5 (three-prime to five-prime) exonuclease activity. An exonuclease removes nucleotides at the end of the DNA chain. Low exonuclease activity means they are less able to remove incorrect nucleotides once added. On the other hand, antimutator strains often have DNA polymerases with very efficient 3 to 5 exonuclease activity. Due to these and other enzymes, a large number of different rates of mutation occur in different systems. Normally, the rate of change is about one in ten billion nucleotides per cell division, but the variance is wide and can be as high as one in ten thousand per generation. Human cells have approximately nine billion nucleotides, and so on average, about one mutation should occur in each round of DNA replication. Mutations can be classified in terms of the structural changes they cause, and in terms of the changes in the genetic information they produce. Point mutations are those affecting a single nucleotide. Point mutations may be deletions or insertions of nucleotides, or changes from one nucleotide to another (substitutions). To understand the types of changes, it is useful to remember that the DNA nucleotides are adenine, thymine, cytosine, and guanine (abbreviated A, T, C, G). Canonically, A pairs with T, C pairs with G. Because of their chemical structures, A and G are referred to as purines, while C and T are pyrimidines. Substitutions, then, may be from purine to purine or from pyrimidine to pyrimidine (transitions), or purine to pyrimidine or vice versa (transversions). The DNA within a gene codes for the amino acid sequence in a protein , and so DNA mutations can lead to protein changes. The code is read in triplets, sequences of three nucleotides. From this, it is readily seen that any insertion or deletion will change the triplet groups, and so may have major effects on the amino acids coded for. This is called a frame-shift mutation. Frame-shift mutations almost always result in nonfunctional proteins. Transitions and transversions often have less drastic effects. In some cases, there is no effect at all. This occurs when the change is from one "synonym" to another in the genetic code ; that is, when the new triplet codes for the same amino acid as the old one. A "nonsense" mutation is much more serious, since this converts a triplet coding for an amino acid (sense) into one with no corresponding amino acid (nonsense). This causes protein synthesis to stop (such triplets are called stop codons ). A missense mutation is also potentially serious, since this changes one amino acid to another. When the new amino acid is chemically similar to the old one, there may be little effect on the protein structure and function. When they differ in size, polarity, or charge the effect may be profound. Such is the case with the sickling variant of the hemoglobin gene. In the 1940s, Nobel laureate Linus Pauling suggested, and, in the 1950s, Verne Ingram demonstrated, that the first well-described "molecular disease" namely sickle cell disease, was due to a mutation that affected just one position in the amino acid sequence of the hemoglobin (Hb) molecule that carries iron in human blood. The underlying mutation was later shown to be a transversion from thymine to adenine. This converts an amino acid near one end of the beta chain of human hemoglobin from a glutamic acid side to a valine. This change, from a negatively charged hydrophilic side chain to a hydrophobic side chain, converts HbA to HbS. This alters the way hemoglobin molecules aggregate at low oxygen concentrations; HbS molecules cause the red blood cells that contain them to bend into a sickle shape. When these misshapen cells obstruct blood flow, an affected individual experiences great pain. Mutation is one of the four forces of evolution; the others are selection, migration, and genetic drift. For a century after the publication of The Origin of Species by English naturalist Charles Darwin in 1859, mutation was often discussed as a source of new variation, but it was seldom considered to be highly important except in rare instances. However, in the 1960s, mutation became a major focus of evolutionary research. The central question regarding mutation in evolution is to what extent mutations are harmful, harmless, or useful. In two experimental papers in 1966, Richard Lewontin and John Hubby demonstrated that many more individual fruit flies are heterozygous (meaning they have two different alleles at a genetic locus ) and their populations had many more polymorphisms (the number of genes with more than one allele present) than could be accounted for by classical population genetic theory. R. K. Selander and others then extended this work for a broad phylogenetic spectrum of organisms. This gave strong support to the ideas of two population geneticists from Japan, Motoo Kimura and Tomoka Ohta, who hypothesized that most mutations were selectively neutral instead of being deleterious, as the standard view was at the time. In their view, mutations increase genetic diversity by giving rise to harmless differences in a gene that can be maintained in a population over long periods. These changes are reflected in the number of alleles (gene forms) within the population. 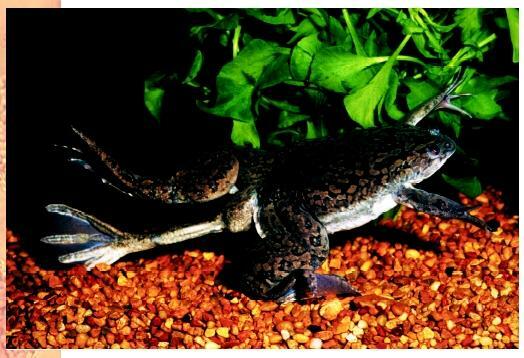 An African clawed frog ( Xenopus laevis ), mutated, with three hind legs. Neutralists (such as Kimura and Ohta) argued that most alleles at a genetic locus were either neutral or likely to have nonsignificant deleterious consequences. If alleles are principally neutral, then changes in alleles frequencies will be driven fundamentally by random forces (principally genetic drift). On the other hand, selectionists thought that alleles are predominantly harmful (with a view that only rare alleles have beneficial contributions), and, hence, natural selection would act to change allele frequencies in a predictable fashion, eliminating most new ones. Kimura and Ohta's recognition of the neutral value of most mutations allowed the estimation of divergence times between related species by analyzing accumulated gene changes; the so-called molecular clock. Parts of proteins that were indispensable to function would be very well preserved and hence have few preserved mutational changes in their related gene sequences. Dispensable portions would have many more mutations. Changes in noncoding DNA regions, such as introns and "junk DNA," can accumulate even more mutations without effect. In the last two decades of the twentieth century, two other major advances were made in the understanding of mutation. First, site-specific mutagenesis allowed molecular biologists to mutate genes almost letter by letter. With this approach, they can look at the impact of changing single amino acids on the structure and function of proteins. Second, a debate on the role of mutation rate and the direction of mutations has been rekindled. In the 1940s, Salvador Luria and Max Delbrück showed definitively that mutations did not arise that specifically addressed some biochemical inability of the organism, such as an ability to metabolize a new food source or to resist pathogenic infection. Instead, random mutations are produced, and those populations with beneficial adaptations survived better than other populations. However, in the 1980s, John Cairns and others challenged the orthodoxy of this view with a variety of new experiments, which they thought indicated that mutations with adaptive value preferentially arose in some bacterial populations. The response from the majority scientific community was rapid. In 1999, Croatian scientist Miroslav Radman, working in Paris, provided the most widely accepted resolution to this conflict. Namely, he and others believe that some selective agents (in many experiments stress was induced by starvation) led to an increase in the overall rate of mutation rather than to an increased production of adaptive mutations. This increases the rate of all types of mutations, including adaptive ones. Mutation rates and genetic adaptability (fitness). Redrawn from Radman, 1999. Kimura, Motoo. Population Genetics, Molecular Evolution, and the Neutral Allele Theory: Selected Papers. Chicago: University of Chicago Press, 1994. Ohta, T. "The Nearly Neutral Theory of Molecular Evolution." Annual Review of Ecology and Systematics 23 (1992): 263–286. Radman, Miroslav. "Mutation: Enzymes of Evolutionary Change." Nature 401 (1999): 866–868. Japanese biologist who demonstrated that chemicals, X rays, and other agents that cause cancer often do so by causing mutations in the deoxyribonucleic acid (DNA) of cells. Sugimura, along with American Bruce Ames, won the prestigious Japan Prize in 1997. Nice article. But I want more information about evolution of human from other spesis. What is spesis according to Charls Darwin's theory? In future is there any possibility to change present human into other spesis by genetic evolution? Is there any example of that kind of genetic evolution in the past or present?